Creating effective learning material starts with instructional design. It has become a concept that is equally popular in both the academic and professional fields. 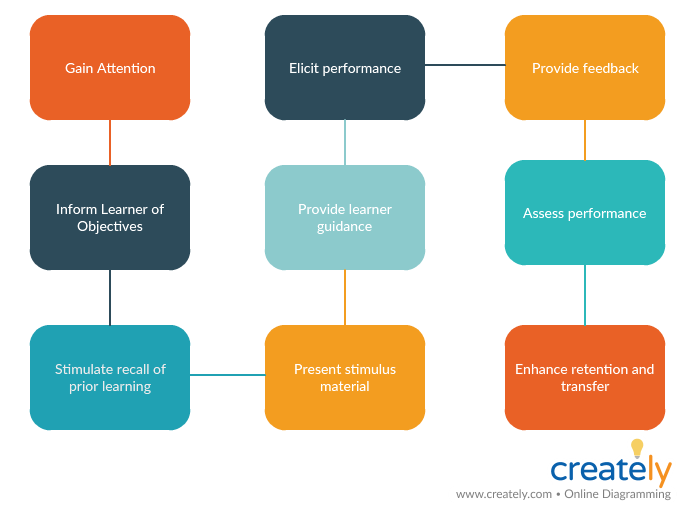 In this post we will look at the instructional design process along with the top instructional design models that you can use to create effective educational and training material for students or employees. Instructional design refers to the process used to create instructional material. It is used to identify gaps in knowledge, skills and attitudes of students or employees, analyzing learning needs and developing learning material to close them. Instructional design helps give meaningful and effective instructions to learners in a way that will make learning easier for them. Here are the steps you need to follow when designing instructional learning material for your students or employees. Conduct a needs analysis to identify the needs of your target audience as well as training and business needs. Based on the analysis done on the learners, create a learner’s profile that includes information on their roles, responsibilities, skills, educational and professional experiences, technical knowledge etc. You should also assess their competency in the topic the training will be based on and the training methods/ they prefer. Identify the learning objectives. These should be based on the outcomes you expect to achieve at the end of the program. Course designing in itself is a process. Once you select the topics for the course or the training program, decide on the instructional approach for it (i.e. video or game based approach). 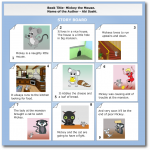 Organize the content and identify a flow using storyboards. You can use it to plan content, images, icons etc. that should be placed on different pages. You can create a prototype of your online course, training program before you start developing it. This will allow you to test it for its effectiveness. Once you have developed and launched the program, monitor and assess it to understand whether it is effective in accomplishing the learning objectives and fulfilling the requirements of the learners as well as that of the organization. Instructional design models are used to explain the process used to design and develop instructions. There are several models that can be used in different settings; following are some of the most popular ones. 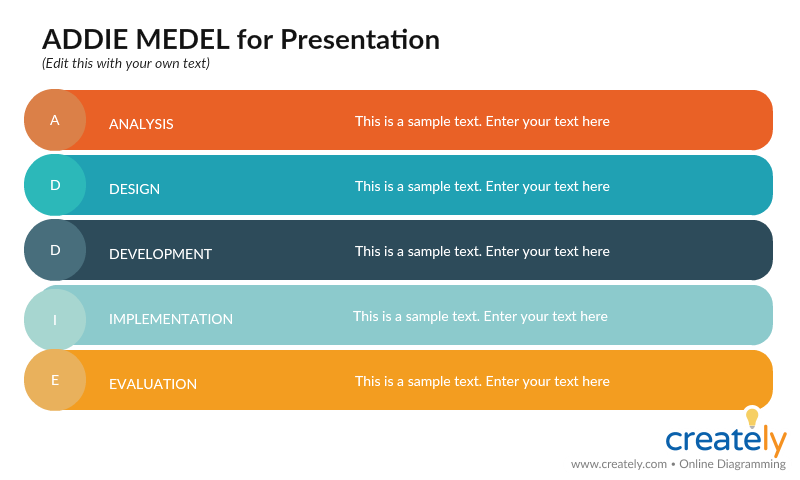 ADDIE is a five-stage process that provides guidelines to create effective training material. It stands for Analyze, Design, Develop, Implement, and Evaluate. Analyze: In this step, the situation is analyzed to understand the goals and objectives for the learning material, requirements, needs, skills and knowledge of the learners. Design: Identify the learning objectives such as the knowledge you want the learners to gain and the learning outcomes. Develop: Identify how you can help the students get to the objectives you identified earlier and develop the instructional strategies accordingly. Implementation: Implement the strategies by trying out your training programs with students. Evaluate: Evaluate and measure the success of the training material you have designed and delivered. Note what needs to be changed. 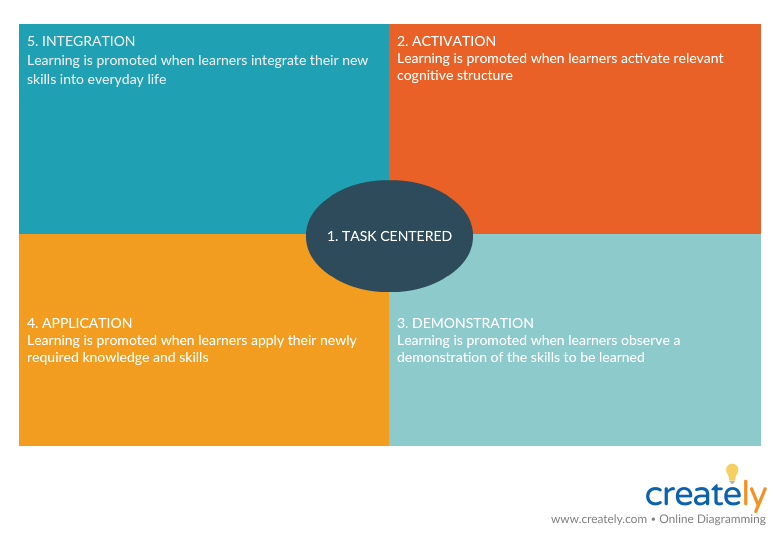 Activation: Learning material should activate the knowledge the learner already has on the subject matter. This helps them use it as a foundation to digest the new knowledge. Demonstration: The trainer/ teacher should demonstrate the knowledge through techniques such as video demos, infographics etc. Application: Learners should be allowed to apply the knowledge they have gathered on their own to solve problems. Integration: Learners should be encouraged to integrate the new knowledge into their life and use it to solve problems. Gain the attention of the students through a stimuli such as a surprise, thought-provoking question etc. Inform the students of the objectives or outcomes of the lesson before the instructions are given. Stimulate recall of prior learning by asking questions about the experience from the past. By relating to this past knowledge, they can easily make sense of the new knowledge. Provide learning guidance with tutorials, case studies, examples, infographics etc. Elicit performance by helping them internalize new knowledge through activities that encourage them to recall and use that knowledge. Provide feedback on the performance of students to facilitate learning. Assess performance by testing whether the expected outcomes have been achieved. Enhance retention and transfer to the job. Help students internalize new knowledge with techniques like concept maps, summarizing, job aids etc. Bloom’s taxonomy classifies the different skills and objectives the educators set for their students. While in 1956 Benjamin Bloom created this classification system to organize the different levels of cognitive learning, it was later modified by Anderson and Krathwohl. Thus it came to be known as the Revised Taxonomy. To learn about Bloom’s Taxonomy in more detail refer to this article. 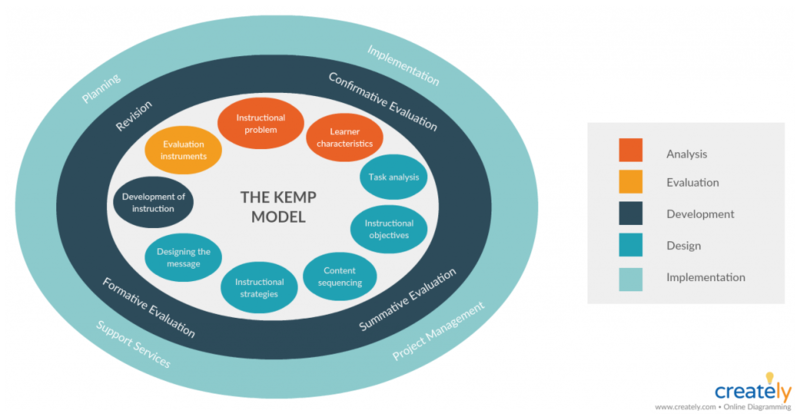 The Kemp design model which has a nonlinear structure or a circular structure conveys that the design process is a continuous cycle therefore needs constant planning, design and evaluation to ensure quality instruction. 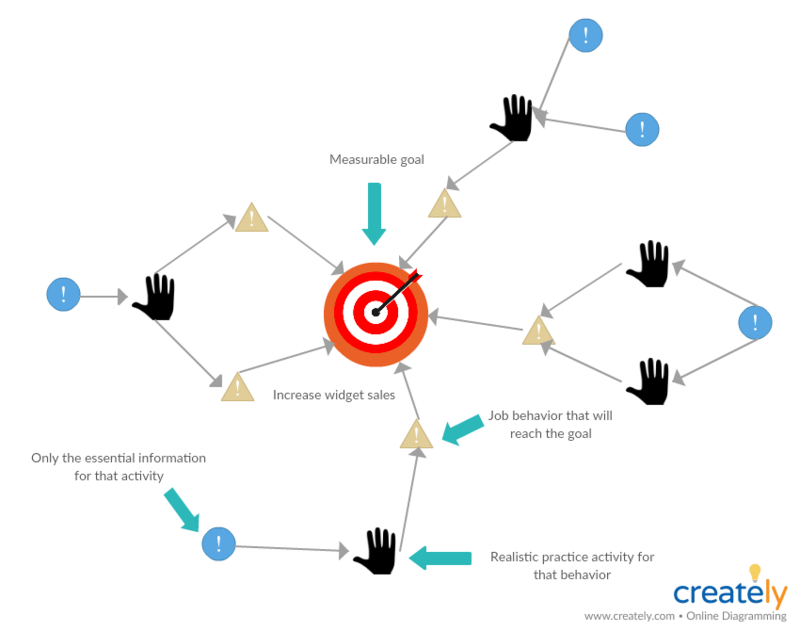 Action mapping by Cathy Moore takes a visual approach to instructional design and is popularly used in the context of business. It’s a process that helps avoid information dumps and create more activity-centered training. Add to the List of Instructional Design Models? You can use the instructional design models discussed above to create an instructional environment and educational material that will guide learners to achieve their learning/ training objectives easily. If you are aware of other popular instructional design models, let us know in the comment section below.